Alexis Spillner, 16, chose her sister Hallie, 6, as the subject of photographs that she produced for the "My Voice" photo exhibit. Participants in the ProjectFocus program came from families in the Women in Need transitional housing project in Waianae. Their images will be on display at various locations through February. Paul Kekuewa is a big, tough-looking guy -- not the type you'd expect to catch in an emotional moment. But tears filled his eyes as he viewed a photograph taken by his grandson. "It made me cry," Kekuewa said. 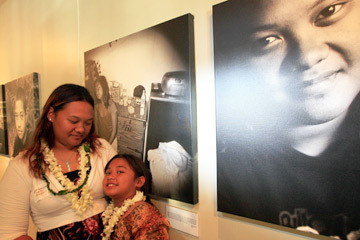 Emotions ran high at opening night of the "My Voice" photography exhibit Thursday at Aloha Tower Marketplace. "Lisa and I always say that if we can bring grown men to their knees, we've done our job," said Laurie Breeden Callies, who with Lisa Uesugi directed the "My Voice" display. "We counted four." 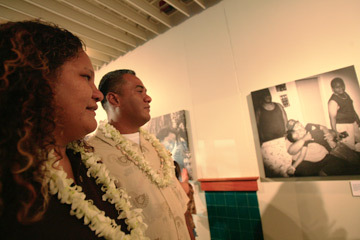 The exhibit was mounted through ProjectFocus Hawaii, a year-old program founded by professional photographers Callies of Baby Face Productions and Uesugi of utopia Photography with the aim of enhancing children's lives through the art of taking photos. The participants, drawn from the Women in Need transitional housing project, were charged with choosing a significant person in their life to photograph. Both participant and the photo subject wrote statements about each other, for display alongside the photos. The statements were not available to read until opening night, so they came as a warm surprise. "I would like to tell my grandpa that he is just like a dad to me and I look up to him because of how he treats me and for all the great things he's done in my life." Kaipo said he and his grandfather do everything together, from games of chess to playing ukulele, even washing the car. "He's a nice man. 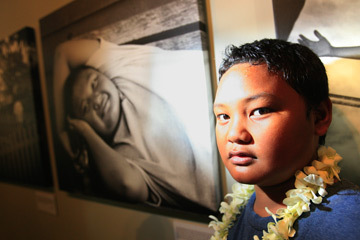 He raised me because my mom was homeless," Kaipo said. Kaipo took the photographs of his grandpa Paul at his sister's hula camp. "It is natural for a grandfather to take care of him and advise him," Kekuewa said. "I didn't even know he took that photo. I was totally surprised." He also said the photo project helped Kaipo, who was very quiet and shy -- in fact, he was diagnosed with a severe speech impairment at age 3. Emily Kekuewa gave son Kaipo a kiss after he gave a speech at Thursday's opening night Kaipo honored his grandfather Paul, who is holding Kaipo's sister Lokelani, 3. The confidence-boosting factor was apparent. Grinning from ear to ear in his snazzy aloha shirt and lei, Kaipo made a speech on opening night. "My grandpa has helped me to become a better person, one that my family can be proud of. He is a great and humble man. When I grow up, I'll be a great and humble man because of all the things he has taught me." After a four-year separation, Kaipo was recently reunited with his mother, Emily Kekuewa, through the Women in Need program, known as WIN. 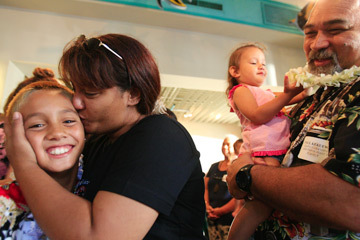 They are living in transitional housing in Waianae but plan to move to Kauai soon. Kaipo's grandfather won't be going with them, but his mother said she is thankful that Kaipo has had such a positive role model. "Kaipo and Grandpa have a special bond that Kaipo and I could never reach. My dad treats him like his own son." The Win program serves the homeless and low-income -- women, men and children in transition or at risk. Many are lifelong victims of domestic violence or drug addiction. The children "have seen more than the average person," said Mary Scott-Lau, executive director of WIN. "Lots has happened." Scott-Lau said the photo project gave the kids opportunities they otherwise would never have had. "They can expand and have hope. It's a wonderful thing to view things through their eyes. They are so proud of their accomplishments." Olive and Kaleuati Kaleuati looked over a photograph taken by one of their children. Instead of feeling ashamed or saying "I can't," she said, the participants' self-esteem soared. "It takes them to another place, where they can accomplish anything. It only pushes them to reach for higher goals." During a 12-week internship, the youths were trained to use a camera, but that was only part of what they learned. Lessons also covered social norms, such as proper handshaking and making eye contact. "I can," "I am" and "I will" statements were solicited from each child, along with essays about the person they chose to photograph. Sean U'u, 14, came up with these affirmations: "I am smart, funny and kind; I can play sports; I will become the first U'u basketball player in the family." Powerful statements from a child who just had hip-replacement surgery and has spent lots of time at Shriners Hospital. "This introspective look at themselves leads to some incredibly soulful photography," said Callies. The kids were enjoying their "shining moment" during the reception, she said. "We hope that they will want more and more of these experiences." Last year's ProjectFocus beneficiary was the Community Teen Program organized under Parents and Children Together. Director Cheryl Johnson said the photo project helped create new bonds between the kids and their sometimes troubled families. The recognition from the participants' families made a huge difference, Johnson said, noting that none chose to photograph friends. "Peers are very significant but everyone picked family members. It really made a connection between the kids and their parents." The evening was especially emotional for Kaleuati Kaleuati and his wife, Olive, whose three children participated in the program but have since gone to live with Olive's brother in Boise, Idaho. "It's amazing what a picture can do for someone," Olive said, tears streaming down her face. "From the sayings, you realize how much they learned from you." Her two daughters, 12-year-old Jazmyne and 10-year-old Tia, chose her as their photo subject. "I miss my kids, and we are just so proud of them," said Kaleuati, who was photographed by 14-year-old son Frank. Frank said in his essay that he chose his dad for his comical ways and "great funny faces," and in appreciation for their father-son bonding times. The couple plans to join the children on the mainland soon. "We sent them because they will have better opportunities, they can get settled and in school," she said. "It really touched my heart to see their photographs. I don't have any words right now." As part of the "My Voice" project, each participant received a professional portrait. Ten-year-old Justin Spillner's was taken by Lisa Uesugi of utopia Photography. Justin's own work focused on his sister, Alexis. Ten-year-old Justin Spillner decided to photograph his older sister, Alexis. "She backs me up, she takes good care of me and she cooks me food," Justin said. She also inspires him to be kind, "because she is kind and smart." He said he was nervous on the way to the reception, but those feelings disappeared upon the unveiling of the photos. "People were cheering for me." Alexis, in turn, said she is proud of her brother. In her statement she said, "My dream is for him to finish school so he can accomplish his own dreams." The kids aren't working with a trained technical eye, but their candid photographs definitely capture feelings. "It's coming from their heart," said Uesugi. "The kids showed us up again this year." Thursday's opening of "My Voice" was treated as a grand occasion. VIP Trans donated bus services to bring the young photographers and their families to Aloha Tower Marketplace, where they were greeted by the governor, University of Hawaii coaches and other public figures. Gordon Biersch Brewery Restaurant provided food. "All these people are here for them," Uesugi said. "It's an amazing experience for everyone." Uesugi and Callies cap off the project by taking a professional portrait of each budding photographer. "Many of these parents can't afford to hire a photographer," Uesugi said. "We want the kids to look at their own pictures and feel beautiful."